Changquan refers to long-range extended wushu styles like Chaquan, Huaquan, Hongquan ("flood fist"), and Shaolinquan, but this wushu form is a modernized style derived from movements of these and other traditional styles. Changquan is the most widely-seen of the wushu forms, and includes whirling, running, leaping, and acrobatics. Changquan is difficult to perform, requiring great flexibility and athleticism, and is often practised from a young age. Nanquan refers to wushu styles originating in south China (i.e., south of the Yangtze River, including Hongjiaquan, Cailifoquan, and Yongchunquan. Many are known for vigorous, athletic movements with very stable, low stances and intricate hand movements. This wushu form is a modern style derived from movements of these and other traditional southern styles. Nanquan typically requires less flexibility and has fewer acrobatics than Changquan, but it also requires greater leg stability and power generation through leg and hip coordination. This event was created in 1960. Taijiquan is a wushu style famous for slow, relaxed movements, and often seen as an exercise method for the elderly. This wushu form is a modern recompilation based on the Yang style of Taijiquan, but also including movements of the Chen, Wu, and Sun styles. Dao refers to any curved, one-sided sword/blade, but this wushu form is a Changquan method of using a medium-sized willow-leaf-shaped dao. Jian refers to any double-edged straight sword/blade, but this wushu form is a Changquan method of using the jian. Gun refers to a long staff (wooden, not made of bamboo as it will split) as tall as the wrist of a person standing with his/her arms stretched upwards, but this wushu form is a Changquan method of using the gun. Qiang refers to a flexible spear with red hair attached to the spearhead, but this wushu form is a Changquan method of using the qiang. Taijijian is an event using the jian based on traditional Taijiquan jian methods. Nandao is a weapon that appears to be based on the butterfly swords of Yongchunquan, but has been lengthened and changed so that only one is used (as opposed to a pair). 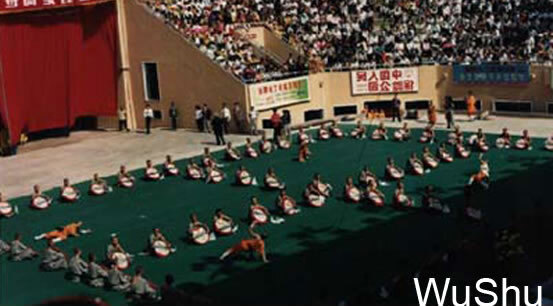 This event is a Nanquan method, and was created in 1992. Nangun is a Nanquan method of using the gun. This event was created in 1992. Copyright © British Kung Fu Association 2017. All Rights Reserved.